Critical to Li-ion battery efficiency, power and lifetime is the formation of a passivating film on electrode surfaces known as the solid electrolyte interphase (SEI). Ideally, the SEI should prevent electrolyte decomposition, allow fast Li+ transport through it into the electrodes, and be mechanically stable during battery cycling. Despite numerous studies on the chemistry and structure of SEI, basic material properties, including mechanical, electron and Li+ transport properties are generally unknown for SEI. In this presentation, predictive modeling starting from first principles calculations was developed to compute these important properties with idealized SEI materials. For example, using density functional theory, we first determined that the dominant diffusion carrier in Li2CO3 below the voltage range of SEI formation is excess interstitial Li+. This diffuses via a knock-off mechanism to maintain higher O-coordination, rather than direct-hopping through empty spaces in the Li2CO3 lattice. Meso-scale diffusion equations were then formulated upon a new two-layer/two-mechanism model: pore diffusion in the outer layer and knock-off diffusion in the inner layer. This diffusion model predicted the unusual isotope ratio 6Li+/7Li+ profile measured by TOF-SIMS. Insights gained from these calculations allow us to select artificial SEI materials, suggest different dopants to enhance Li conductivity in SEI films, and propose a new mechanism for electron leakage through an SEI film into the electrolyte. 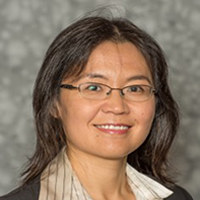 Dr. Yue Qi is an associate professor in the Chemical Engineering and Materials Science Department at Michigan State University, East Lansing, MI. She received her PhD in Materials Science from California Institute of Technology in 2001. She was a co-recipient of 1999 Feynman Prize in Nanotechnology for Theoretical Work during her PhD study. After her PhD, she spent 12 years working at Chemical Sciences and Materials Systems Lab, General Motors R&D Center, Warren, MI. At GM, she led multi-scale modeling research to solve problems related to forming and machining of light weight alloys, and developing energy materials for batteries and fuel cells. She won three GM Campbell awards for outstanding research on various topics and TMS Young Leader Professional Development Award. Her recent research interest is integrating material failure model with battery life prediction. She has published more than 80 peer-reviewed journal papers and gave many invited presentations in the international conferences, including the first Batteries Gordon Conference.